I’ve been waiting all fall for the Brussels sprouts at the store to get good looking and cheap. 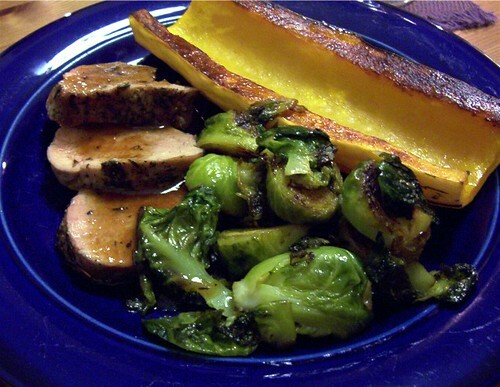 I finally decided it was time, so I bought a big bag of sprouts and a fresh pork tenderloin and dug out the delicata squash from the fruit bowl. This is a notable dinner because it consists of two different vegetables I absolutely loathed when I was young. J was in charge of the pork. He seasoned it with salt, pepper and thyme, seared it whole in a cast iron pan and put it in the oven for 20 minutes or so. Then he made an absolutely fabulous pan sauce with chicken stock and some reduced apple cider. Mmmmm. It had a wonderful intense, savory apple flavor. The Brussels sprouts I did my usual way (I could never eat them until I discovered this method) – I trim the stems off the sprouts and peel off any nasty outer leaves. Then I bring a pan of water to a boil, drop the sprouts in and simmer them until they turn bright green. Then I drain them, slice them in half, and sizzle them in plenty of olive oil with a few cloves of chopped garlic until the sprouts are browned and any loose leaves have crisped up into little chips. A good sprinkle of fleur de sel and they’re ready. The squash was cut in half lengthwise, cleaned out, oiled and salted, and put cut side down on a parchment-covered baking sheet in the oven along with the pork. It takes them about 20 minutes to get soft and the cut surfaces get brown and caramelized. 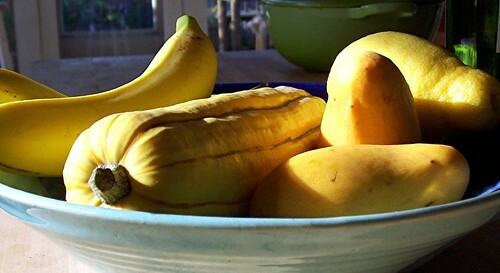 I owe my discovery of the delights of delicata squash to my grandfather, who was the first person to serve them to me. He sets them in a shallow pan of water so it all stays tender, but I like the brown crust. All the flavors of the dinner worked really well together, especially the pan sauce over the Brussels sprouts. We drank a Snoqualmie Naked Gewurtzraminer that we had left over from the day before, which was a perfect match. Brussels sprouts are my husband’s favorite. I make them the same way you do, except I also throw in some red seedless grapes toward the end. So good! I bought some delicata squash the other day. I had never seen it before and didn’t know what to do with it. Now I do. Thanks.